this DLSC Nadia District Recruitment are 118 posts. Candidates with prescribed criteria have to visit the DLSC Nadia District official website http://www.nadia.gov.in and apply through online from 21-12-2017. Last date to send application forms is 05-01-2018. Pay Scale for this GPK jobs is Rs. 4900/- to Rs. 16,200/- plus Rs. 1700/- Grade Pay and other allowances. Candidate must have passed Class VIII and must be Indian Citizen. DLSC Nadia District Gram Panchayat Karmee Jobs selection is based on written examination and Viva voce Test. 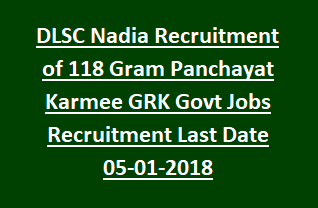 Other particulars like Eligibility criteria, age limits, pay scale, Application procedure, Selection process of District level Selection Committee DLSC Nadia District Gram Panchayat Karmee GRK govt Jobs recruitment are given below. Written exam date: will be published on website. Available vacancies in Nadia District Level Selection Committee DLSC Recruitment are given below. Total no of vacancies: 118 posts. Post Name: Gram Panchayat Karmee (GPK): 118 posts. Candidate must have passed VIII class from any recognized Institution. As on 01-01-2017 age of general candidates is 18 years to 40 years. SC, ST, PwD candidates is 18 to 45 years. OBC-A, B is 18 to 43 years. For Ex-serviceman is 18 years to 50 years. Pay Scale for GPK jobs is Rs. 4900/- to Rs. 16,200/- plus Rs. 1700/- Grade Pay and other allowances. Nadia DLSC Recruitment of Gram Panchayat Karmee Jobs selection is based on written examination and Viva voce Test. Written examination will be held for 43 marks. Questions will be from class VIII. Applicants having all eligible criteria can submit the applications through the website http://www.nadia.gov.in. Online registration of applications for DLSC posts starts from 21-12-2017 to 05-01-2018.